The Last Of Us Part II’s Co-Writer Will Be In The Game, Too! Halley Gross (who helped writing episodes of HBO’s Westworld before) will be in Naughty Dog‘s game as a character. The Last Of Us Part II was announced at the 2016 PlayStation Experience, and we learned shortly thereafter that Gross will help Neil Druckmann, the vice president of Naughty Dog, with the writing of the game’s script. Since then, the game without a release date was mentioned several times (the last time we discussed it, it was because of the devs looking for a multiplayer server programmer), but now, it’s Gross’ turn in the news. „Guys, I’m in a video game! (I was super cool about it. ),” Gross wrote on her Instagram. You can see the paint used for motion capture sessions on her face, which means her facial movements were digitalised. They are effectively confirmed to show up in The Last of Us Part II, although we have yet to find out how much of involvement will her character have in the PlayStation 4-exclusive game. 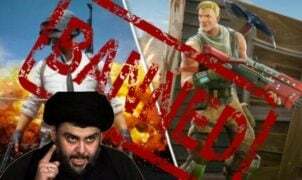 Another Country Says No To Battle Royale Games!